Photo caption: Ward staff (left to right): Billy Petty – Director of Worship, Bryan Guelzo – AVL Engineer, Austin Germain – Director of Production for Worship, Gerry Kropf – Broadcast CoordinatorWard Evangelical Presbyterian Church in Northville, Michigan, has a long history in the Detroit metro area and now a recent lighting upgrade to Elation Professional LED fixtures is heightening the worship experience. 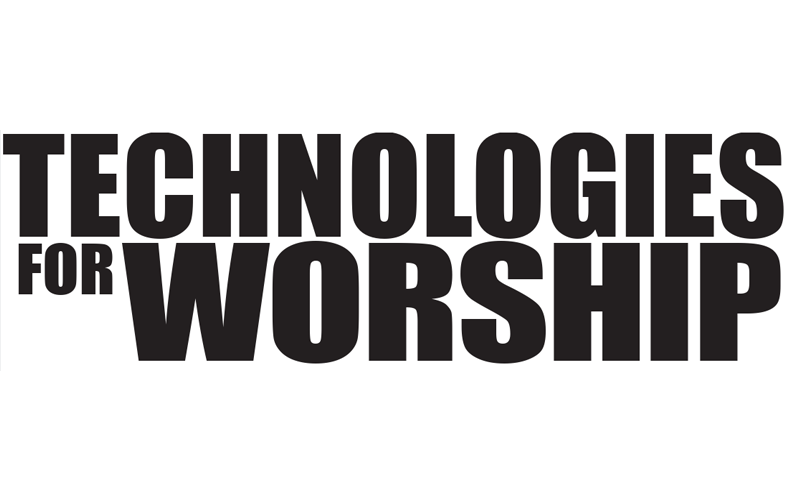 In 2013, in an on-going effort to reach out to more people and at different levels, Ward began to offer four different worship styles in three different venues, all on the same campus. When a contemporary service was launched, Bryan Guelzo was brought in as part of a full A/V renovation. 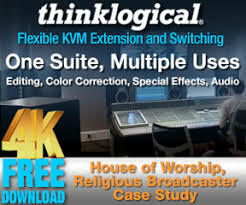 “When the current building was built about 15 years ago, no one had dreamed that Ward would be holding a contemporary service, let alone shoot HD video, Imag and stream services online,” stated Bryan, who has worked as Ward’s full-time AVL Engineer since July of 2014, working alongside Austin Germain (Director of Production for Worship), Billy Petty (Director of Worship) and Gerry Kropf (Broadcast Coordinator). With audio and video well in hand, Ward staff decided to turn their attention to the stage lighting, which consisted of a handful of conventional PAR cans and some ellipsoidal fixtures, both of which were in need of some serious attention as half of them no longer functioned, according to Bryan. Ward had no moving lights and no color other than a handful of generic washes. The need for an upgrade of the lighting system was extremely apparent if they were going to significantly enhance the worship experience. In late October, Fantasee installed 12 Platinum Spot LED Pro II color and pattern lights and 12 Rayzor Q12 Zoom compact LED wash luminaires, as well as a new lighting console, control software, hazers and wireless DMX. All of the lighting fixtures are located on three overhead beams in the main Sanctuary. To finish off the project, Fantasee also refurbished and re-focused all of the Church’s existing conventional fixtures to be used as stage wash, leaving the new movers to be used for effect lighting. The Platinum Spot LED Pro’s built-in EWDMX wireless DMX receiver was a big hit for Ward as they wanted the ability to reconfigure their space quickly and easily, as well as repurpose the fixtures to other locations in the future. 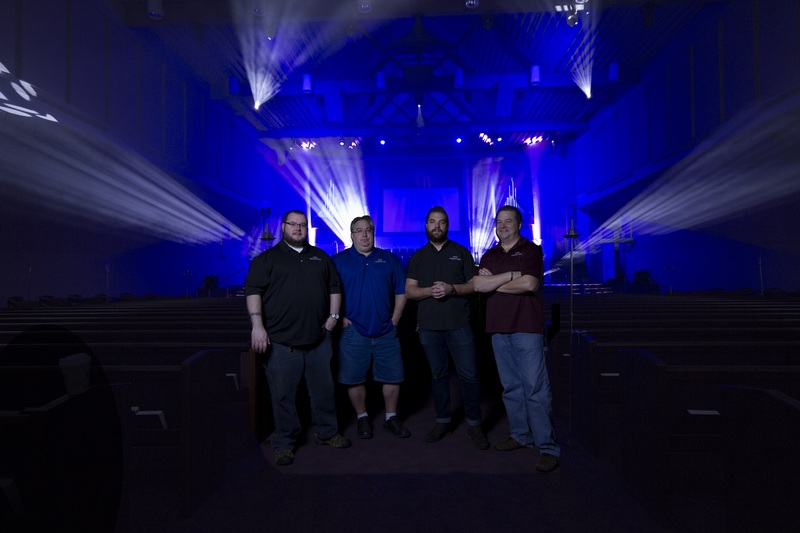 “The wireless DMX built into the Elation products was a huge factor in the decision to go with Elation,” Bryan comments. “At Ward, we hold the Contemporary service at 9:30am and the Traditional service at 11:00am. This leaves us less than 30 minutes to completely strip the stage of all traces of a contemporary service and set it up for the Traditional service. With up to 10 movers and 4 hazers on the stage for contemporary service, not having DMX cables to clean up is a big time saver during our between-service transitions.” Each overhead beam is fed switched power to the fixtures from constant power circuits in the dimming system. DMX comes directly from wireless to the Platinum Spot LED Pros and feeds out from them to the Rayzor washes. Fantasee was able to work around the church’s holiday program practices and maintain a working light system on the off hours. “Fantasee was able to design a system that perfectly fit what we were trying to accomplish,” says Bryan. 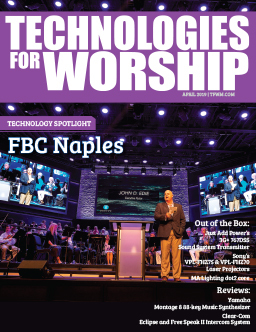 The entire project was completed on time and under budget which allowed the church to recently order eight of Elation’s new SixPar 100 PAR color changers.